The FenceRider Frog is much smaller than other frog divers.This little diver/slider "rides the fence." 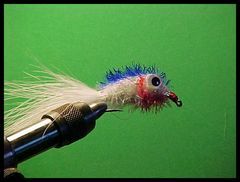 It's small enough to take big bluegills yet large enough to attract bass. This little frog is the companion to the Orange Belly FenceRider Frog. 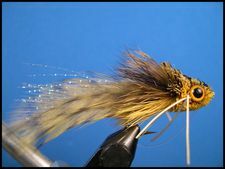 They are my favorite topwater flies for for Bass and Jumbo Bluegills.. 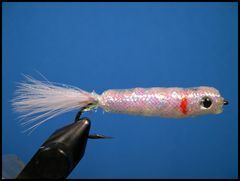 The Skipping Minnow is a great choice when the bass are chasing shiners or other baitfish. 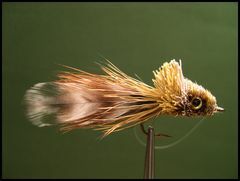 The HairyMara Slider is one of my better producing topwater flies for bass and big panfish. It can be tieid in a number of colors or combination of colors, but I prefer the original olive and yellow pattern. 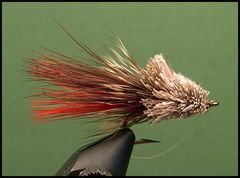 This is one of the flies in Jack Ellis's Farm Pond Series. The little diver is a companion to Jack's Fence Rider Bug found on the Chugger and Popper page. This little diver was designed by Jack Ellis, author of "The Sunfishes: A Flyfishing Journey of Discovery." 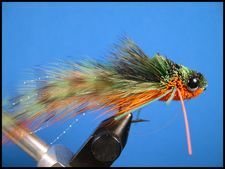 It's only about one inch long, but it's a great little fly for bass and panfish. 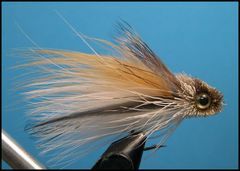 The Fathead Shad is one of two of Jack Ellis's variations of the original Fathead Diver. The other variation is the Fathead Frog. The Fathead Frog is the third in the Jack Ellis Fathead Series. The other two are the Fathead Diver and the Fathead Shad. 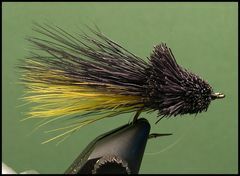 Black and yellow are two deadly warmwater colors that I have combined in this version of the Fathead Diver. It's a great little diver to use on dark overcast days or in stained water. The Kentucky Wonder Slider has proven to be very effective for taking Smallmouth and Kentucky Spotted Bass on Northeast Oklahoma's Illinois and Barren Fork Rivers. The Spooky Shad was designed to fish over shooling bass on Toledo Bend Lake in East Texas but it works just as well on other species attracted to top water offerings. Bill Heugel also ties the Spooky Shad with a rattle inside to add noise to make the Spooky Shad even more effective on schooling bass. 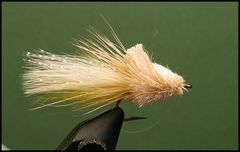 This Foam Minnow created by Iowa fly tyer Lance Zook is deadly when the black bass are looking up. 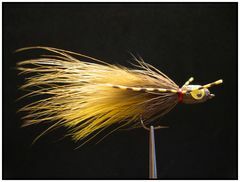 This is East Texas author and angler Jack Ellis's favorite largemouth bass fly. It's his version of Dave Whitlocks Hare Water Pup.